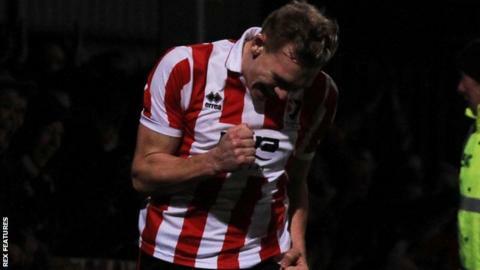 Cheltenham maintained their lead at the top of the National League with a narrow win over Altrincham. The visitors were the better side in the first half, but Michael Rankine could only fire their best chance wide from close range. Cheltenham improved after the break and went ahead after Gianluca Havern fouled Harry Pell in the box and Danny Wright found the corner from the spot. Altrincham failed to respond and slip to 19th after back-to-back defeats. "It was an important result for us of course, but Altrincham have done alright. I know they are lower in the league, but they seem to do be doing alright in the season. "Fortunately going down the hill, we put a little bit of pressure on them in the second half and a good bit of play to earn the penalty. It's a good job that Danny Wright is clever with what he does. "It's three great points, we've got to make sure that we are still the ones they've got to catch, so as long we aren't slowing up or tripping over then we stay ahead of the chasing pack." Match ends, Cheltenham Town 1, Altrincham 0. Second Half ends, Cheltenham Town 1, Altrincham 0. Attempt missed. Daniel Wright (Cheltenham Town) right footed shot from outside the box misses to the left. Attempt saved. James Dayton (Cheltenham Town) right footed shot from outside the box is saved. Substitution, Cheltenham Town. James Rowe replaces Ryan Jennings. Attempt missed. Michael Rankine (Altrincham) header from the centre of the box misses to the right. Attempt saved. Jordan Sinnott (Altrincham) right footed shot from the centre of the box is saved. Substitution, Cheltenham Town. James Dayton replaces Jack Munns. Substitution, Cheltenham Town. Andrija Novakovich replaces Billy Waters. Foul by Ryan Jennings (Cheltenham Town). Attempt missed. James Lawrie (Altrincham) right footed shot from outside the box is too high. Attempt missed. Billy Waters (Cheltenham Town) right footed shot from outside the box misses to the left. Attempt missed. Jake Moult (Altrincham) right footed shot from outside the box is too high. Assisted by James Lawrie. Goal! Cheltenham Town 1, Altrincham 0. Daniel Wright (Cheltenham Town) converts the penalty with a right footed shot to the bottom left corner. Gianluca Havern (Altrincham) is shown the yellow card for a bad foul. Penalty Cheltenham Town. Harry Pell draws a foul in the penalty area. Attempt saved. Daniel Wright (Cheltenham Town) header from the centre of the box is saved. Assisted by Jack Barthram with a cross.